Lent begins with Ash Wednesday and I encourage you to take your children to an imposition of ashes service. 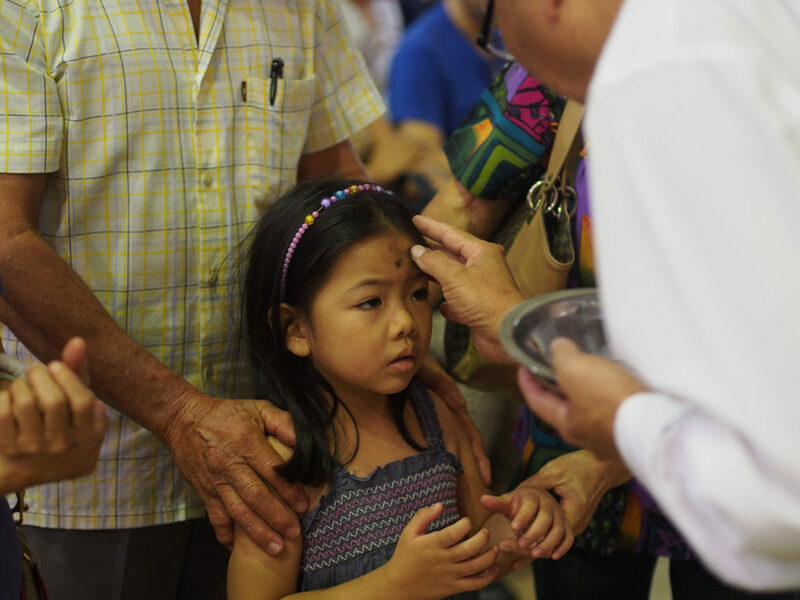 Three years ago Derek Olsen wrote about why he takes his children to church on Ash Wednesday and it remains the most read post in our Grow Christians archives. As parents we struggle with the idea of reminding ourselves and our children of their mortality. As a result, we often shy away from bringing our kids to church once they start to understand what the ashes are all about. In just a few days, Sara Irwin will share a post about how Ash Wednesday has changed for her as a mother as her children aged. The tension she expresses is precisely the reason why I’ve opted to attend a noon service while my kids are in school the past few years. This will be the year I finally bring them back to church on Ash Wednesday. Photo taken by John Ragai on Ash Wednesday 2015. What then happens after Ash Wednesday? There are countless ways to observe Lent as a family. It can be something as simple as a visual reminder of the season like using a purple tablecloth or placing a cross in middle of your table. With a bit more effort, you can easily create an age appropriate sacred space in your home with objects symbolic to the season of Lent. Grow Christians contributor Emily Watkins wrote this insightful post about her family’s evolving sacred space for Building Faith a few years ago. I definitely recommend reading it! In our household we’ve successfully added a small spiritual discipline to our family life during Lent the past few years. I set my alarm fifteen minutes earlier than usual so that I can start the coffee, pack lunches, prep breakfast and unload the dishwasher before the children come downstairs. This allows me to sit at the table with them over breakfast rather than scurrying around the kitchen like a half-asleep mother who hasn’t yet had her coffee. Two years ago I read them a chapter from The Path Family Storybook while they ate cereal each morning. By the time Holy Week arrived, we’d journeyed through the entire bible as a family. Last year we participated in the Good Book Club, taking turns reading from the Gospel of Luke in our Adventure Bible between bites of food. This year, we plan to read from The Saintly Scorecard and play Lent Madness as a family. Sharon Ely Pearson’s Way of Love for Families. It’s a free download that will help households engage the seven Way of Love spiritual practices and deepen their relationships with God and one another. Lectionary based free printable resource from Candle Press . 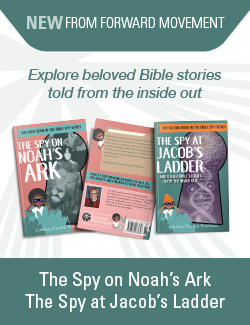 Each week’s printable includes a paraphrase of Sunday’s gospel reading, reflection questions and suggested activities. Lent in a Box. Family Ministry Tools created the devotions and activities, but you will need to print them and buy the supplies for your boxes. When I was growing up my parents always asked us to join them in giving up something for Lent. No matter how many times they explained it, I never could make the connection between Jesus’ 40 day fast in the wilderness and my abstaining from chocolate. As a result, I’ve never asked my kids to fast from anything. This year though, I’m ready. We are approaching Lent as the opportunity to reset some unhealthy habits. I’m looking at you, Screen Time and Online Shopping. The former has become something I allow my kids to do when I simply don’t want to hear them fighting or want a break from engaging them myself. The latter has simply grown excessive and we want to put that money to better use. What behaviors or habits have become troublesome for your family? What would it look like to fast from over-scheduling, whining or going out to eat during Lent? I pray that your household is able to observe Lent in a way that sets it apart from the rest of the year. Consider this season to be an opportunity for your family to both grow closer to God and one another, and also a time of turning away from temptation and turning toward God. How will your household observe Lent this year? Very informative especially when children ask so many questions. All the answers are here for all to understand.